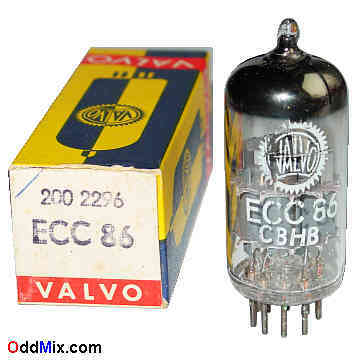 This is a genuine, original ECC86 Valvo Frame-Grid Twin Triode RF Low Voltage electronic tube. Developed for RF low voltage applications - combined detector, amplifier, oscillator, self-oscillating mixer use in automobile receivers. This tube can be directly operated by a storage battery - no high voltage supply is necessary - thus lend itself for safe study. Excellent for replacement, antique radio, instrument restoration projects, experimentation, circuit research or to set up a private vacuum tube museum. It is NOS tube - New Old Stock, unused, excellent, collectible condition. First come first serve, only one of this rare, discontinued, historical vacuum tube available!